16. 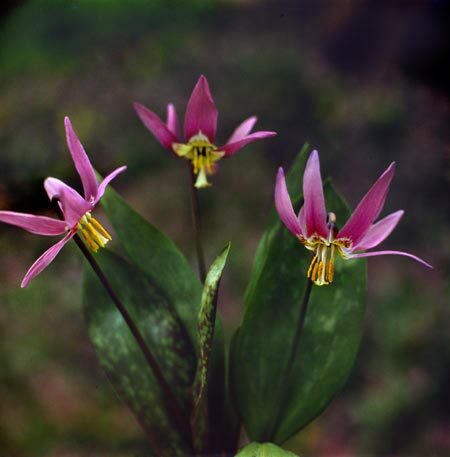 Erythronium Linnaeus, Sp. Pl. 1: 305. 1753. Herbs perennial, bulbiferous. Bulb deep seated, usually cylindric or narrowly oblong; tunic membranous. Stem simple. Leaves 2, borne near middle of stem, apparently opposite, petiolate, unequal, usually ± reticulate veined. Inflorescence 1- to several flowered, racemose or umbellate; bracts usually absent. Flowers bisexual, nodding, rather large. Tepals 6, free, spreading, recurved, or reflexed. Stamens 6, inserted at base of tepals; filaments filiform to slightly flattened, usually unequal; anthers basifixed. Ovary 3-loculed; ovules several to numerous per locule. Style filiform or slightly thickened distally; stigma 3-lobed. Fruit a capsule, subglobose to ellipsoid, 3-angled, loculicidal. Seeds compressed or somewhat swollen. Twenty-four species: temperate regions of the N hemisphere, mainly in North America; two species in China.